Our knowledge of the internal structure of Neptune is inferred from the planet's radius, mass, period of rotation, the shape of its gravitational field and the behavior of hydrogen, helium, and water at high pressure. This cut-away view shows Neptune composed of an outer envelope of molecular hydrogen, helium and methane roughly the mass of one to two Earths. Below this region Neptune appears to be composed of a mantle rich in water, methane, ammonia, and other elements. These elements are under high temperatures and pressures deep within the planet. The mantle is equivalent to 10 to 15 earth masses. 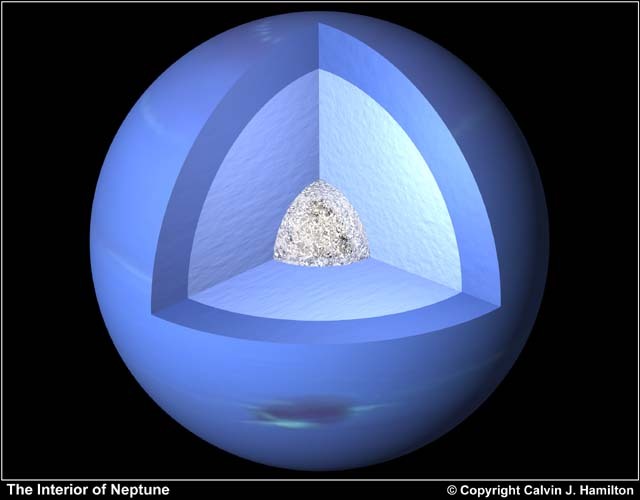 Neptune's core is composed of rock and ice, and is likely no more than one Earth mass. This image is © Copyright © 2001 by Calvin J. Hamilton. Any commercial/for-profit use of the image needs to be addressed to the Author.